In two weeks, Washington voters have an opportunity of a lifetime to vote for one of the most equitable and just climate policies in the recent history of the state. 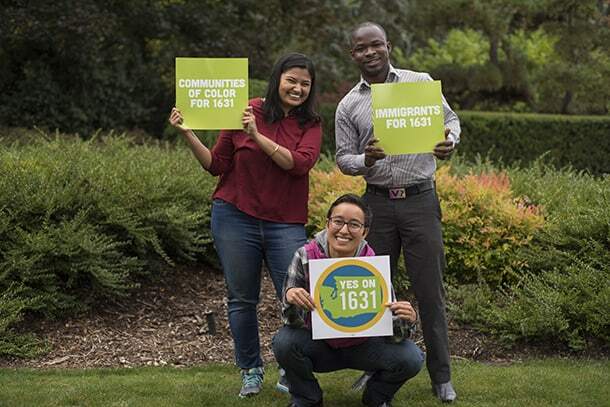 I-1631 is a ground-breaking policy that makes big polluters pay for their share of the pollution and ensures that Washington residents and our future generations have a healthy, clean and economically vibrant place to live in. With equity and a just transition to clean energy as a core principle in the design, I-1631 devotes 35 percent of the total revenue to communities that have borne the most harm from fossil fuels and climate change, and another 10 percent in energy rebates to low-income households to help them reduce energy costs. In four years, the Clean Up Pollution Fund could generate about $1 billion in revenue, with $350 million going to health action areas and $100 million towards reducing energy burdens. This means that for every $5 generated from the revenue, $2 will be invested in communities most impacted by pollution and climate change. Time is of essence – and Big Oil (the world’s six or seven largest publicly traded oil and gas companies) is spending over $25 million to mislead Washington’s voters to keep this ballot measure from becoming law. Big Oil argues that this policy doesn’t go far enough to hold them accountable; therefore, we shouldn’t vote for it. This argument lacks standing, however, when you look at how much money they are pouring into fighting this legislation. Why would they invest millions of dollars in fighting I-1631 if the law wasn’t going to be effective in holding them accountable to pay for their messes? The climate crisis is growing deeper with every minute of lost action, and while this policy won’t stop climate change, it is a first big step we can take to do our part to stave off massive climate disaster. Last week, a report from the United Nations highlighted that we have barely 12 years to address climate change. It tells us what many people already know – that people are already paying the price of climate change and a hotter planet, with their lives, both across the world and at home. Year after year we are thrashed by hurricanes from Sandy to Maria to most recently Florence and Michael, filling the news with pictures of people deep in water waiting for rescue. In Washington state, summers have become worse, with huge wildfires generating intense smoke and ash-rain that make our loved ones cough and that trigger asthma attacks. The less money you make, the more likely you are to live near a source of heavy pollution – and we know that people of color and people with lower incomes are already paying the highest price for living near sources of pollution – with people in south Seattle living on average, 13 years shorter than people in north Seattle. With these disparities in mind as some of the core problems to be addressed, I-1631 was crafted by a coalition of people of color, tribes, environmental groups, businesses, scientists, farmworkers, labor unions, workers and health professionals to develop a policy that addresses the multiple facets of a smooth and just transition to a clean energy economy. Big Oil is now also supporting the narrative that the well-studied and needed interventions recommended in I-1631 are “special projects”. These “special projects” will be fact-based interventions to protect our shoreline communities from sea-level rise, protect our homes and health from wildfires, and to train workers to install solar panels and wind turbines. These are core elements of a transition from a fossil fuel economy to a clean energy one. The projects would be decided on by a 15-person oversight board that will be staffed with department heads, scientists and those representing highly impacted communities like workers, tribes, people with lower-incomes and businesses. Boards like this are a standard and best practice to gather community oversight on government activity and are subject to public disclosure like any public entity. Big Oil has been putting out ads critiquing the very function of government itself calling this group an ‘unaccountable non-transparent board.’ This demonstrates a lack of familiarity with processes to garner public input in developing in public policy and government practices. In reality, the oversight board is one of the strongest components of I-1631, built in to ensure accountability. It requires state agencies and leaders from impacted communities and tribes – those who have been historically left behind in policy decisions – to work together. The projects will be carefully vetted to lift-up the priorities of these impacted communities as laid out by people and scientists who advocate for mindful community solutions. This is not the first time such a board has been in existence in Washington’s legislature. One of the proven and time-tested democratic ways to allocate funding for specific programs is with a gubernatorial-appointed committee of local experts and state departments. Washington state has over 230 commissions – some with significant financial oversight that is comparable to what is proposed in I-1631. For example, the state allocates funds for legal services fees and transportation projects. That said, it would be naïve to assume that the oversight board will be a perfect one, devoid of problems. But will it help us counter climate change with true accountability in its roots? Absolutely yes. Unlike its predecessor I-732, a revenue neutral, market-based carbon tax, I-1631 charges a fee of $15/ton from the big polluters in the state and reinvests the revenue back into our communities to reduce pollution and foster health and climate. The fee increases by $2 each year until Washington reaches its emission reduction targets. The revenue generated from the fee is split in three buckets. While 70 percent of the revenue goes to drive clean air and clean energy options like solar, wind, energy efficiency, transit, electric vehicles, 25 percent goes towards clean water and healthy forests and the remaining 5 percent towards building healthy communities to prepare them in the face of climate change. In total, I-1631 covers 80 percent of the total emissions of Washington state. The remaining 20 percent that is uncovered includes the Trans Alta coal plant – which Big Oil loves to highlight as a “hypocritical” exclusion. The truth is, the the coal-fired power plant in Centralia is already slated to close down by 2025. Subjecting it to a fee would delay the shutting down, adding more emissions to our air. Big Oil also highlights that I-1631 will bump up the monthly utility and gas prices for low-income communities and working families. This argument comes in the same year the Trump administration gave a 14 percent tax break to all corporations, with big oil receiving a $25 billion dollar pay out. What Big Oil is essentially saying is that instead of applying that massive tax break to absorb these costs and pay for polluting our planet, they would choose to pass it on to us, the consumers. Now that being said, assuming they passed on all of the costs to the consumer – we would pay roughly 14 cents more per gallon. An amount that falls within the normal price changes. Gasoline, unlike other commodities, is relatively price inelastic. That means that if gas prices go up or down, the demand doesn’t change. Why? Because our infrastructure was built in a way that makes us reliant on gas. Other, cleaner, technologies boom when we stop rigging the market in favor of fossil fuels. This attention to accountability and tangible solutions is why our coalition came together to craft a smart and mindful policy that address the complexities of our economic realities. For decades, Big Oil has played on our fear and mistrust to keep us from collectively holding them accountable. I-1631 is our opportunity to challenge them and demand our right to a clean and healthy Washington.